You are here w/ us, every day. Thank you for the amazing artifacts. They are in good company. Scott had an impressive collection of both designer neckties and globally acquired casino chips that he decided to disperse during the farewell party in High Point,in Los Angeles at the send off we had there,and he carried some on our travels, too, for friends he knew we would be seeing and new friends he is making. His idea is that now every person he gave a tie and/or a chip to is now connected to both Scott and to each other. Oooohhh, his cousin Alison said, Now we’re all human casino chips! we like that idea. 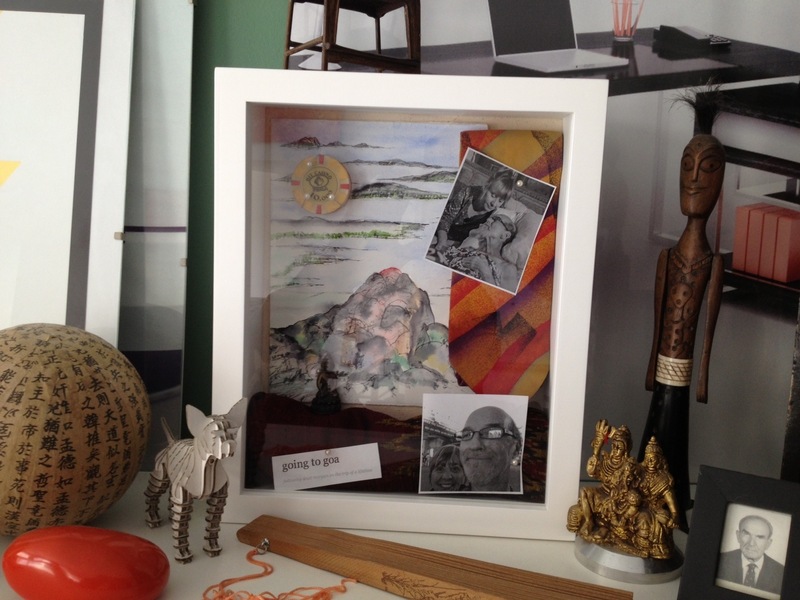 Shown here is a shadow box Scott’s friend Dario made from Scott’s art, tie, chip, and pics of us from the blog. This entry was posted in Uncategorized and tagged art, casinos, collage, friendship, Going to Goa Blog, human casino chips, neckties, orange 22, painting, philosophy, photography, Scott Morgan, shadowboxes, traveling with cancer. Bookmark the permalink.